Commemorate the third issue of Star Wars! Commemorate the third issue of Star Wars! This Star Wars Comic Book Issue #3 Cover Paper Giclee Print is a gorgeous piece of artwork by Alex Ross, who did the artwork for 2013s Star Wars #3 comic book, and features quite the stunning montage image of battle scenes aboard an Imperial Star Destroyer. 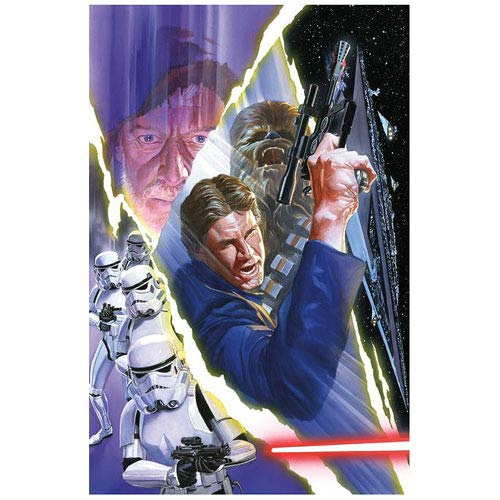 The giclee is divided into 4 parts: one of the sections shows Obi-Wan Kenobi looking resolute in the face of death, another section features Stormtroopers firing their blasters, the next section is of Han Solo with his blaster at the ready along with Chewbacca roaring, and the final section is of multiple Imperial Star Destroyers floating through space. Printed on paper, this gorgeous giclee has been signed by the artist and is a limited edition of 77 hand-numbered pieces. Complete with certificate of authenticity, this giclee measures 22-inches tall x 17-inches wide.